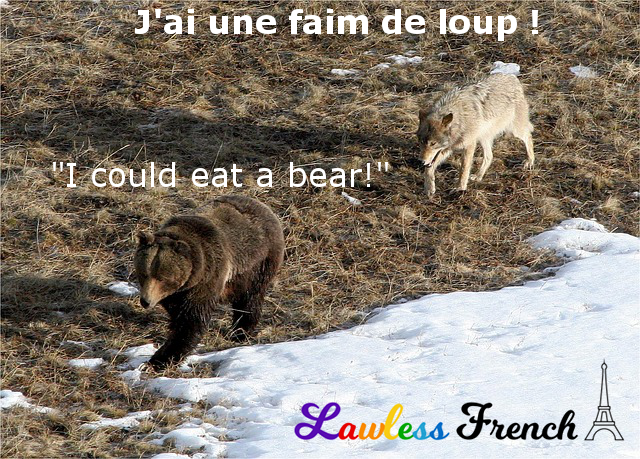 Usage notes: English speakers talk about being hungry enough to eat a big animal, such as a bear or horse,* while French speakers talk about being hungry like a big animal: avoir une faim de loup. J’espère que le dîner est prêt, j’ai une faim de loup ! 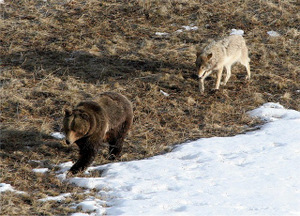 I hope dinner is ready, I could eat a bear! Both languages have many other expressions related to great hunger. avoir l’estomac / le ventre creux – literally: "to have an empty stomach"
avoir l’estomac dans les talons – "to have the stomach in the heels"
avoir une de ces faims – "to have one of those hungers"
être affamé – "to be famished"
mourir de faim (je meurs de faim) – "to be dying of hunger (I’m dying of hunger)"
avoir la dalle – "to have the throat"
avoir la fringale – "to have raging hunger"
avoir les crocs – "to have the fangs"
claquer du bec – "to click at the mouth"
crever de faim – "to be dying from hunger"
crever la dalle – "to be dying (at) the throat"
crever la faim – "to be dying (of) hunger"
A growing youth has a wolf in his belly (proverb) Un jeune homme en pleine croissance a un loup au ventre.